In these fiscally tough times, fire departments and other emergency services are increasing their emphasis on EMS, haz-mat, public education, and public relations more than ever before. This involves the need for more training, and more information flow. All multimedia presentations benefit greatly from a clear, professional voice-over. Those which are produced in-house often suffer from poor audio quality, and narrations recorded by your own personnel can be distracting to your audience. Where do you go to find a voice-over artist? You can take a chance on looking locally, searching the internet, or asking-around (we all have people in our organizations who "know a guy"). You can wade through dozens of auditions from an online casting service and hope to make a connection, or you can enlist the services of Diamond Plate Productions for top quality voice, music and sound services delivered by a professional fire officer with a working knowledge of and enthusiasm for the material, and all at a surprisingly low cost. Providing narrations and voice-overs for a variety of presentations is the backbone of Diamond Plate Productions. My affordable narrations are presented in a clear, natural tone, not in the booming movie trailer voice and not salesmanlike or "announcer-ish" (unless that's what you want). Using professional microphones and studio equipment combined with precise editing capabilities results in a finished product that cannot be surpassed technically. My knowledge of and entusiasm for the material being delivered will produce results that cannot be matched artistically. All Diamond Plate Productions narrations can be combined with original or production music and sound-effects as well. See the above "Production Music" tab for more information. I am a full-time Fire Lieutenant in Connecticut with a strong background in music and recording. A few years ago a co-worker of mine on the Fire Department commented that he was impressed with my speaking voice. He is a web designer and asked me to record a voice-over for a site he was constructing. This was the impetus for me to pursue a second career in voice-overs. I recieved some formal instruction in voice-over techniques and soon realized that I could combine all of this with my Fire Service experience to create Diamond Plate Productions. New advances in home recording technology also helped to make all of this possible. My technical talents as an engineer and producer grew from being able to squeeze out decent sounding demos from my original Casio keyboard, drum machine, and a 4-track reel-to-reel tape deck years ago, to operating the PC based digital sound processing equipment that I now own which makes this business possible. Having a working knowledge of the material being delivered and of the intended audience gives me an edge over other voice-over artists that cannot be overcome when producing material involving Emergency Services. In addition to my many years of recording and production experience I bring to the table 15 years of experience as a career Firefighter and NFPA certifications which include Fire Officer, Fire Instructor, and Public Fire/Life Safety Educator. All of this results in a delivery that is unmatched in realism, accuracy, and enthusiasm. Be sure to visit the FAQ section of the site for more information and contact me for more information and ideas about what Diamond Plate Productions can do for you. Thanks for listening ! 1. WHAT EXACTLY IS IT YOU DO ? I am a voice-over artist and musician. I record narrations using scripts that are provided to me by the client so that the audio can be added to the client’s presentation. I can also provide music and sound-effects for presentations. 2. WHAT DO YOU MEAN BY "PRESENTATION" ? Any audio/visual media presentation. If it has voice, music, or sound in it, I can do the audio for it. Some examples are… A DVD promoting a new apparatus or piece of equipment, or an instructional video demonstrating how to operate it. Training and fire prevention videos. Public service announcements or informational presentations introducing your organization to the community. Telephone system prompts (IVR), message/music on-hold. Streaming web audio. Music and narration for graduation/promotional ceremony slide shows. 3. DO YOU ALSO SHOOT AND EDIT THE VIDEO FOOTAGE ? No. I provide the audio for your finished video. You will be provided with the finished, edited audio files in the format of, and on the media of your choice. You are responsible for incorporating this audio into your presentation. Your video production outfit should be able to do this. 4. DARN, I WAS HOPING I COULD GIVE YOU MY FINISHED VIDEO AND HAVE YOU DO ALL OF YOUR AUDIO WORK ON IT. ARE YOU SURE YOU CAN'T HELP ? In some cases I may be able to work with your video and deliver the finished product. I am not an experienced video editor and my video equipment is only of consumer quality. I would have to look at each situation individually. The extent of this would be to add the audio to your existing video. I do not do any video editing at this time. If I am able to work with your video at all, it would need to already be edited. 5. WE HAVE SOME GREAT TRAINING VIDEOS THAT ARE ALREADY DONE. IF WE HAVE YOU NARRATE THEM, ISN'T IT GOING TO BE WEIRD HAVING YOU TALK OVER ALL OF THE OTHER SOUND ON THE VIDEO ? Your video editor should be able to remove the existing audio and/or lower the volume of it as required, replacing it with my work. 6. I DON'T WANT ANY OF THE ORIGINAL AUDIO FROM MY SCBA TRAINING VIDEO USED BECAUSE IT'S DISTORTED, BUT I'D LIKE TO BE ABLE TO HEAR THE SOUNDS THE SCBA MAKES. CAN YOU HELP ? Yes ! I have a large number of fire / emergency sounds effects which can be dubbed into your presentation. What I don't have I can probably custom-record for you. Traveling to your location to record your own sounds is even possible with my remote recording gear. 7. WE WOULD LIKE TO USE A SONG WE LIKE TO ACCOMPANY A SLIDE SHOW, BUT THE SONG IS NOT LONG ENOUGH. CAN YOU EXTEND IT SOMEHOW ? Yes. If it pertains to audio, chances are good that I can do it. I can piece sections of a song together, snip sections out, make them faster or slower, whatever you need, as long as there are no copyright violations involved..
8. WHAT KIND OF MUSIC CAN YOU PROVIDE FOR ME ? I have a large library of production music in all styles available on my web site for you to audition. You can choose what you like and I can manipulate it to match the feel and the timing of your project. I own licensing rights for this music so there are no royalty or copyright issues involved for you. You can audition this music at MitchAmatrudo.com I can also compose and record music specifically for your project, such as a "jingle" if you prefer. 9. WHY SHOULD I HIRE YOU TO NARRATE MY VIDEO ? Let's say you are producing a training video about hose streams. There was a typo on the script that you provided to the voice talent whom you hired from an online casting service. Nobody catches the error and the video goes into final production at great expense to you. When you view it for the first time you are horrified to hear the narrator say "The correct nozzle pressure for a handline with a solid-bore nozzle is 500 psi". Somebody added a zero and the narrator only knows to read what was given him. This mistake cost you thousands, and if you look outside you might be able to see the poor guy on the end of that line flying through your county. As a Fire Officer and EMT, I can be a last line of defense against such errors, and I will take the time to confirm any material that appears questionable to me. If you are writing your own copy (copy is the termfor the material that a voice-over guy reads) for the first time, sometimes what looks good on paper might not work well when read aloud. Most full-time voice talents will read what is given to them and call it a day. I am willing to take the time to edit your copy so that it presents effectively to the intended audience. These changes can be communicated to you for final approval before production. If you need minor changes made after delivery of the final audio as is sometimes the case, I am willing to work with you to make these changes at little or no additional cost to you. This is my part-time job, not my livelihood. Because of this I am able to devote the time needed to ensure your satisfaction. Satisfaction which is guaranteed. I take great care to provide you with the highest quality audio possible. Your files will be cleanly and precisely edited, mastered at appropriate volume levels, and free of distortion. I am not happy unless you are happy, and my testimonials speak for themselves. 10. MY BROTHER OWNS A CAR DEALERSHIP AND WANTS TO DO A RADIO COMMERCIAL. DO YOU DO WORK FOR OTHER TYPES OF BUSINESSES IN ADDITION TO EMERGENCY SERVICES ? CAN YOU DO SOMETHING IN THAT ANNOYING "CAR COMMERCIAL VOICE" ? 11. WHEN MY JOB IS COMPLETE, HOW WILL YOU DELIVER IT TO ME ? The files can be burned to a disk and mailed or shipped. I can deliver them via e-mail, FTP, or they can be downloaded from your password-protected client page. 12. I HAVE A RECORDING OF A SEMINAR ON AN OLD CASSETTE TAPE AND WOULD LIKE TO HAVE IT TRANSFERRED TO A CD. CAN YOU DO THIS ? Yes. My studio is equipped to handle cassettes, CD's, albums, DVD,s DAT, "digital 8" video tape, VHS, floppy disks, memory cards, flash drives, and more. Data can be transferred between either. 13. I'M ALSO INTERESTED IN HOME RECORDING. CAN YOU TELL ME WHAT KIND OF EQUIPMENT YOU HAVE IN YOUR STUDIO ? "Your recordings are terrific, better than I could hope for. From an artistic perspective your voice and recordings are great. I am thrilled to have some voice-overs that are not "Testing one two three, check one, check, check." "Again I could not be happier with the results here, you have exceeded my expectations. I will be passing your name around to some other folks who work audio here"
"Many thanks again for the solid work"
"Thank you for all your hard work with our audio recordings, it has worked out wonderfully. You can take pride in knowing that your recordings will continue to be used to enhance performance of public safety communications equipment. My personal goal is to make the best sounding terminals on the market, your work has become an integral part in that." In many cases when someone calls your organization on the telephone and there is no real person available to answer it, they will be greeted with a message that was recorded by an employee speaking into a handset. Many businesses now use a professional voice-over artist to record their IVR audio (Interactive Voice Response). 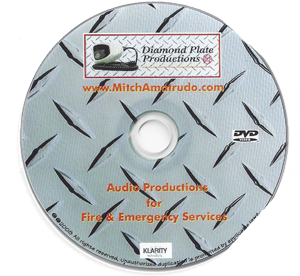 Diamond Plate Productions can provide this same professional edge to your Fire Department by providing you with professionally recorded audio files that your telephone service provider or IT Department can install. Packages are available which include no-charge updates or additions as your needs vary or your personnel change assignments. This allows you to pay just once, making budgeting easier and avoiding hassles with Accounts Payable. this can be combined with background music and sound-effects. I own a large library of license-free SonicFire® SmartSound production music, encompassing a wide range of musical styles. We can select the music that is appropriate for your project, and even customize it to fit the appropriate mood, adding or subtracting instruments as required. If none of this is quite right for you I can compose and record something just for you, where you will have license-free music that you can truly call your own, rather than something that is available for others to use as well. I also have a large library of Emergency Service sound-effects that I recorded myself that can be incorporated into any project created by Diamond Plate Productions. Click here to be redirected to the Mitch Amatrudo Voice, Music & Sound production music page where you can audition and select the music of your choice. Editing audio files for length, content, etc.